A dark grey pottery incense burner, the bowl shaped basin supported on three feet in the form of growling bears with their left paw raised. The conical openwork cover is modelled as a range of overlapping mountain peaks, interspersed with a number of small cavities that hold animals, including bears and a boar’s head. Each of the bear-shaped feet is moulded as a miniature sculpture and is posed in an almost human stance, in minute details with bulging eyes, peaked ears, rounded belly and four strong limbs. The incense burner retains traces of purple, white and red pigments. 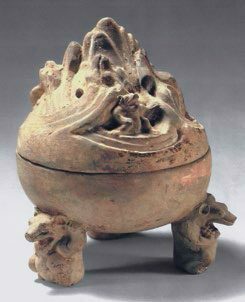 This beautifully modelled and detailed incense burner of a form known as boshanlu, meaning ‘mountain censer’, is a very unusual example of its kind dueto its form and its decoration. 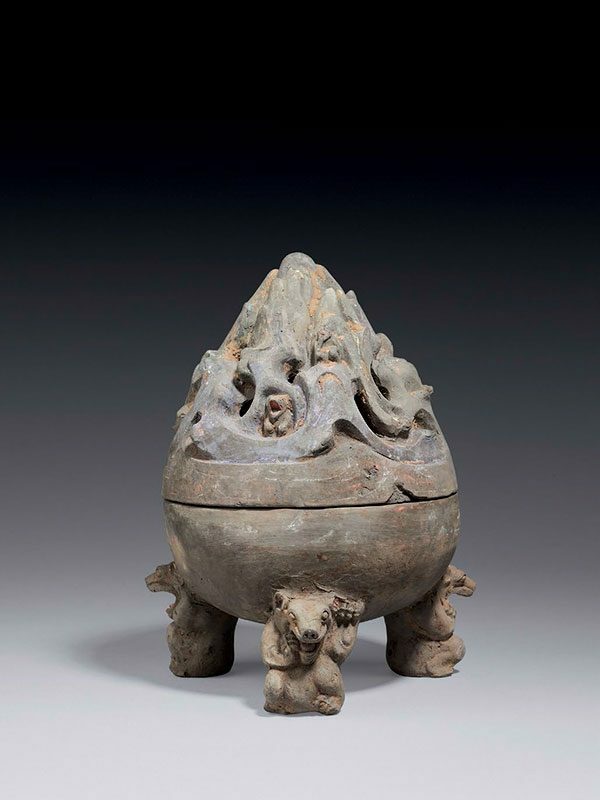 The use of bear-shaped feet seen on this boshanlu is highly unusual; bears, symbolising bravery and strength are commonly seen as supports on many types of Han dynasty vessels but are atypical for incense burners. There is only one other known comparable incense burner recorded with these unusual bear-shaped feet and with other animals on the cover; it is in the collection of the Metropolitan Museum of Art, New York (fig. 1). The occurrence of mountains forming the lids was fairly common on more typical boshanlu supported on a bowl-shaped base, as well as other Han dynasty pottery shapes: a typical metal boshanlu is preserved in the collection of Mr. and Mrs. John D. Rockefeller at the Asia Society Galleries, New York;  several pottery examples are in the Meiyintang collection.